The GARMIN Foretrex 201 is very easy to use, supports multiple languages and has an extremely sensitive antenna. It is the perfect partner for any outdoor activities. It helps to navigate and displays and records information about your movement, such as the current heading and speed, the travelled path (track), maximum and average speed etc. The built-in serial interface supports data exchange with a PC. Note: The Foretrex 201 has all the features and functionality of the Foretrex 101, including PC interface capabilities for downloading waypoints, tracks and routes, but operates on a built-in, rechargeable battery and has smaller unit dimensions. *) The content of these data fields are user configurable, see table below. The page "Trip Computer" consists of 7 data fields, split into 4 views. The content of these data fields are user configurable, see table below. You may select the same content for multiple fields. 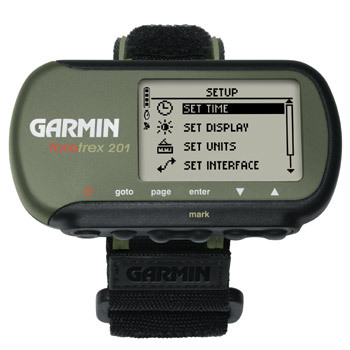 GARMIN Foretrex 201: This model has been discontinued; however, you can still order options for the Foretrex 201. 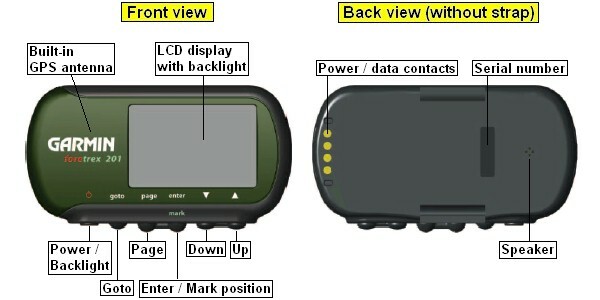 All options for the GARMIN Foretrex 201 in detail. Here we provide additional documentation and software updates related to the Foretrex 201.